(1)1st impression: it gives a general shape of your mouth. (2) 2nd impression: a very accurate impression to form the foundation to build your dentures. (3)Wax block: It will be the guide to set up the teeth. (4)try wax denture in: It is a good time to see the look and you will be able to feel how the wax denture is working. 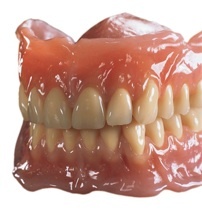 (5)Denture complete: You can confidently wear your new dentures.